For the first time, hotel prices paid in three world regions have overtaken their pre-financial crisis levels of 2008/2009, with North America, the Caribbean and Latin America setting new records, although the overall global rise is up just 1% in the first half of 2015 compared to the same period in 2014 according to the latest Hotel Price Index (HPI) from Hotels.com. M ore travellers , higher consumer spending in key areas and strong currency fluctuations have all contributed to this result. 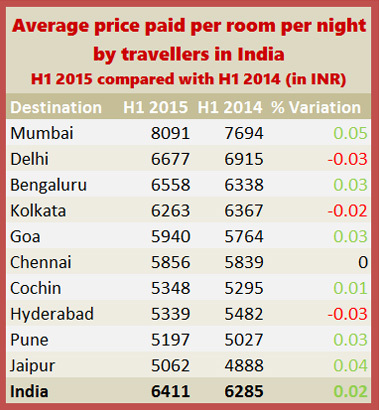 In India, overall hotel prices paid by all travellers saw a marginal rise of 2% in the first six months of 2015 to an average of INR 6,411. The commercial capital of India – Mumbai recorded the highest rise of 5% with an average of INR 8,091 making Mumbai the country’s city where travellers paid the most in the first half of 2015. Delhi retained its second spot despite a fall of 3% with an average of INR 6,677. While cities like Bengaluru and Pune both had a marginal rise of 3%, Goa which recorded the highest rise of 12% last year, saw a minimal rise of 3% with an average of INR 5,940 in the first half of 2015. Chennai saw no change in price variation for hotel accommodation in the first six months of 2015 as compared to the same period last year whereas metro cities such as Kolkata and Hyderabad recorded a fall of 2% and 3% respectively. Travellers will be delighted to find that Jaipur continues to serve best value among the cities analysed with an average of INR 5,062 despite a rise of 4%. The HPI is a regular report on hotel prices in major destinations across the world, tracking the movement in prices that people actually paid for their accommodation and providing valuable insight into the reasons behind these changes. The data is drawn from bookings made on the hundreds of thousands of hotels on the Hotels.com websites worldwide.